This Target Power configuration can be used to measure voltage as well as current on the target board. Channel A (CHA) is a connector with two terminals, one for Voltage In (VI) and one for Voltage Out (VO). Connecting the CHA VI terminal to the target power supply section allows voltage measurements to be made. Connecting the CHA VO terminal to the target board provides the same current information as the modular connection. The modular cable still needs to be connected, though, to provide communication to the emulator. The VO connection is simply the Vdd connection after the sense resistor. It must connect to the device Vdd connection to complete the circuit and allow measurements to be made. In this configuration, the modular cable Vdd connection must not be connected on the target, i.e., the device or target section must be isolated from rest of the target board. 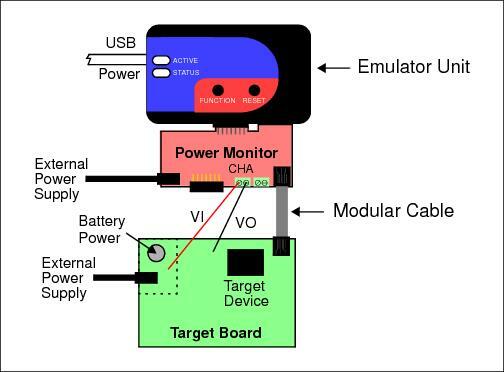 In this configuration, you can continue powering the target from the emulator or you can power the target board independently. In the Project Properties window, click on the “Real ICE” category and select the “Power” option category. Locate the checkbox “Power target circuit from REAL ICE”. Check to power the target from the emulator. Uncheck to power the target with its own power supply.